See Saban’s Lucky Charm, Miss Terry & Her Lucky Fist Bump! New University of Alabama President Guy Bailey steps down today because of wife's health issues. "Today I have notified Chancellor Witt that I am stepping down as President of The University of Alabama. This is a decision my wife Jan and I made together after much discussion about how we can best address her health, which is the most important priority in our lives. By announcing this decision today, I hope the Board of Trustees will be in a position to take the next appropriate steps during its meeting in Tuscaloosa this week. We want to thank the faculty, staff, students, alumni and our many friends for your warm welcome. My family and I appreciate your understanding and your prayers." Bailey took the position back in July of this year. 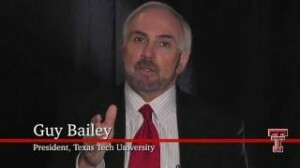 "We understand and respect that President Bailey’s priorities at this time must be focused on his wife Jan’s recovery. Join Our Alabama Crimson Tide Facebook Page!